A rendering of the Studio Movie Grill theater planned for Willow Grove Park mall. The Willow Grove Park mall could soon become a one-stop destination for food, drinks and a movie. A proposal to transform the former J.C. Penney department store into a new Studio Movie Grill location was given the green light by Abington Township's Board of Commissioners on Wednesday night. The 11-screen, 1,100 seat complex would include a full dinner menu and a bar to boot, according to project plans available online. Studio Movie Grill is a Dallas-based chain that markets itself as a modern movie-going experience with full-service, in-theater dining. Service buttons at seats allow moviegoers to order food and drinks and have them delivered before or during the show. SMG has one other Philadelphia-area location on 69th Street in Upper Darby, which opened just down the block from the Tower Theater in 2015. Similar cinematic-culinary combos in Collegeville, Flourtown and Exton. 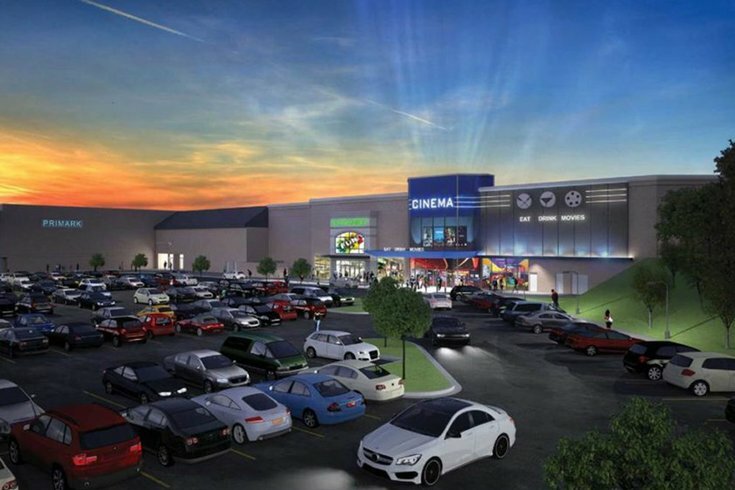 The mall, owned by Pennsylvania Real Estate Investment Trust, plans to open the theater by Labor Day weekend of 2019. Representatives of PREIT and Studio Movie Grill presented plans to the board in a two-hour-long public hearing on Wednesday, with the mall's manager and a traffic engineer providing testimony. The board unanimously approved the project. The theater would require only the existing space left vacant last summer when the old J.C. Penney store was one of at least 130 locations shuttered by the retail chain, a move that affected some 6,000 workers nationwide. Mark Gamble, vice president of development at PREIT, told the commissioners that the theater would be laid out over the first two stories of the three-story space. In the hearing, which was recorded in a video available on YouTube, Gamble said the mall plans to keep the current Cheesecake Factory on the third floor and open a new restaurant on the floor in space formerly occupied by a Bravo Cucina restaurant. Gamble and other PREIT executives hope that moviegoers who opt not to dine at the theater will instead head upstairs to Cheesecake Factory or another restaurant. Abington Township Commission Matt Vahey voiced his support for the project in a post to his website on Thursday. "We need to make sure (the mall) stays healthy as a business," Vahey told PhillyVoice. "It's a trend across the country that malls are struggling." "As malls across the country adapt to an e-commerce economy, I am thrilled to see the mall add an exciting new attraction, which I believe will help the mall stay strong for many years to come," he added. The project offers a much-needed addition for Abington residents, whose nearest movie theater is about a 20-minute drive away, he noted. Studio Movie Grill has nearly 30 locations in the United States. The full project application can be found here.